A baked potato is real comfort food. It is amazing how many "ugly" baked potatoes people make and serve up. Baking potatoes are very simple but please do not follow some of the restaurants out there who bake their potatoes in tinfoil. My take on this is that many restaurants use tinfoil to keep the potatoes warm for a long time. If they did not use tinfoil, they would have to microwave the potato and that would be really ugly. If you bake a potato in tinfoil, you get a potato that is very moist inside with an almost slimy texture. Do it the right way and you get a potato that is light and fluffy inside. For a complete video check out my YouTube Channel. To bake a potato properly, in my opinion, it will take at least one hour at medium-high heat. That’s around 375°F or 190°C give or take a few degrees. First, start with the right potatoes. I prefer white or yellow flesh potato. They have nice thin skin, and the skin is so tasty when prepared right into a potato pocket. I will come to this later. I do not use the “baker” potatoes. I think the skin is too rough and tough. However, if you like to use them, go ahead. Wash and remove any blemishes from the potatoes. 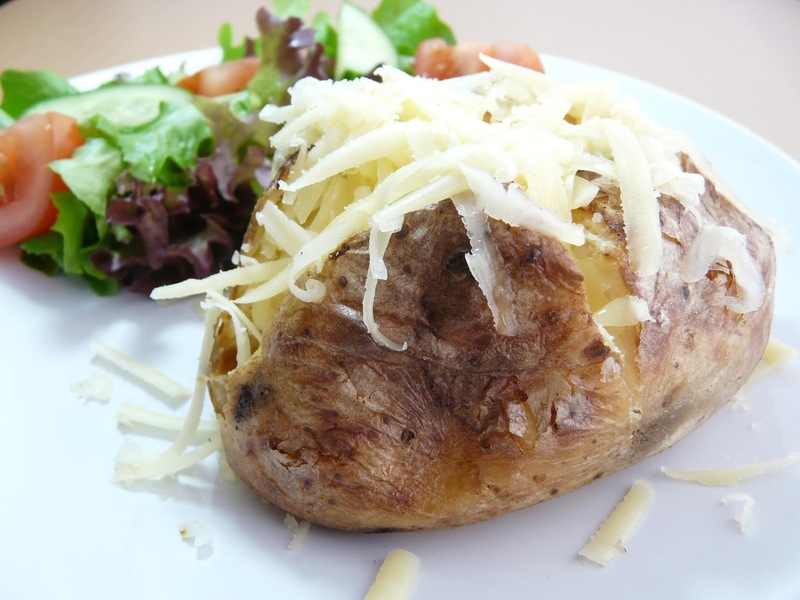 It's OK to cut off a piece of the potato if it has a cut or blemish in it. With a dinner fork, poke the potatoes about 5-6 times on each side, this is to let the moisture escape while they are cooking. If you do not do this, the potato may explode, and you have one heck of a mess. I talk from experience here. Set the potatoes on the BBQ or in the oven. I prefer the BBQ; the heat somehow seems dryer and the skin cooks to perfection. If you have two or more burners on your BBQ, use indirect cooking. If you have an upper rack on the BBQ, use it. If you bake the potato over the fire, build a little tent out of tinfoil to reflect the heat down. Over the fire, you have to keep a close eye on the heat source and turn the potato more often. If you have a cast iron pot, you can turn it upside down over the potatoes to keep the heat in. The best way is to time the potatoes, so they come off the BBQ directly to the plate. If the potato has to sit for a while, then cut a plus sign across the top and give it a squeeze. This is so the steam can escape and not make the potato wet and mushy inside. If they have to sit for more than five minutes, then make sure they sit on a preheated plate to keep them warm. OK, back to the skin. My favourite way of eating baked potatoes is like this. 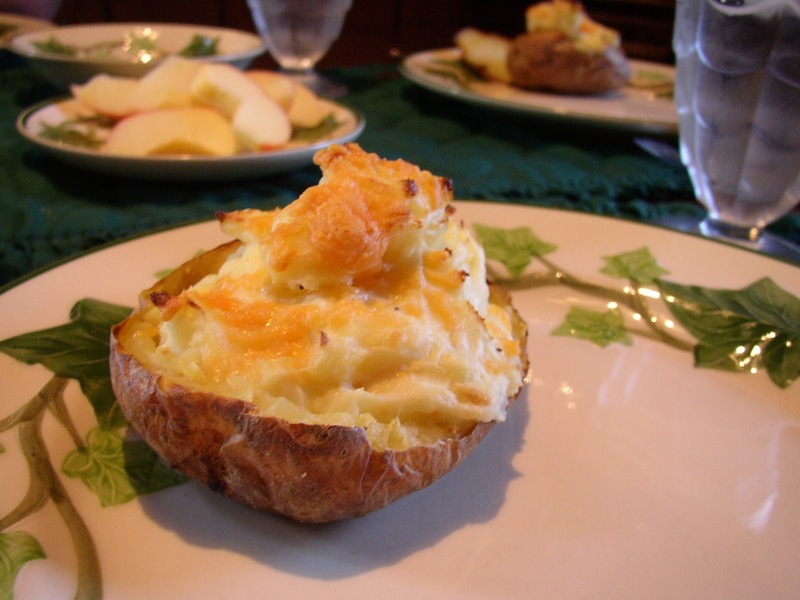 Cut the baked potato in half, crosswise, as soon as it comes off the BBQ and lands on your plate. Then scoop out the potato flesh from both halves onto your plate. The skin is now empty and forms a little pocket. Put a little butter in each pocket, some salt, pepper and maybe some chopped green onions. Pinch the skin closed and set aside for at least 5 minutes. In the meantime, add whatever you prefer to the potato flesh. Try some butter, sour cream, chives, green onions, bacon bits or cheese and you are set. Once the potato skin has sat for at least 5 minutes or more, it is ready to be eaten. Just munch it up as it is. Be prepared that some of the butter may run out, so roll up your sleeves. Best potato skins ever!